The Zutto Jr. is a brand new design that is ideal for junior’s ages 10-12. Equipped with 3 different size nose bridges and View’s E-Z silicone strap, the V-720J is easy to adjust and fit. Additionally, the Zutto Jr. is treated with an anti-bacterial coating to resist unwanted bacteria from pool decks or changing rooms. 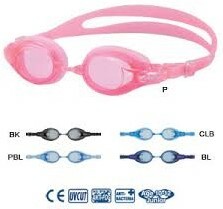 Complete with thick silicone eye seals the V-720J is perfect for those kids who love to swim.